Meniere’s Disease — Is There Any Help Available? Home/Vertigo / Dizziness / Menieres/Meniere’s Disease — Is There Any Help Available? You may have heard of Meniere’s disease, but if you have not experienced it yourself, you may wonder what it is. It is actually quite a rare condition of the vestibular system, originating from a problem in the inner ear. The vestibular system is the body’s way of keeping its balance and determining its location in its environment. When anything interferes with the functioning of this system, a number of balance issues can ensue, including Meniere’s disease. What are the symptoms of Meniere’s disease? However, this is not the end of the story. Just stating what the most common symptoms are is not the entire picture of the disorder. Symptoms often change depending on if it is before, during, between, or after attacks. There is also a late-stage of Meniere’s disease. 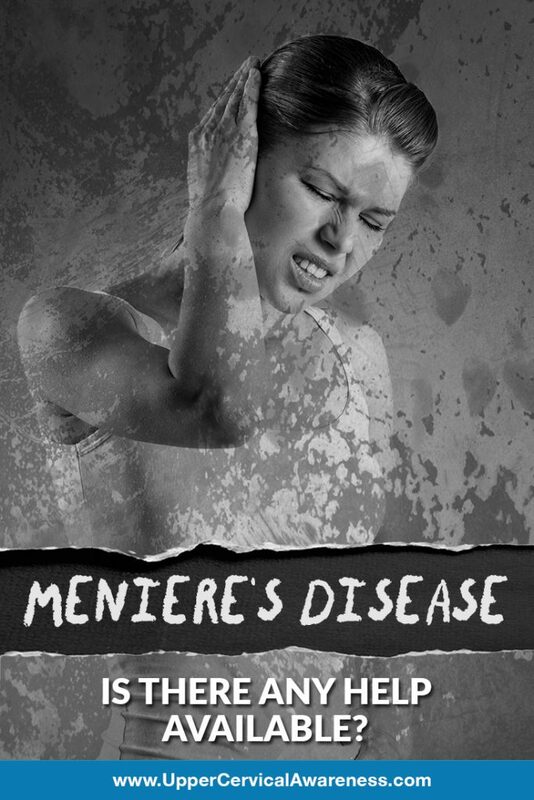 When Meniere’s moves into early-stage, you will probably notice vertigo that comes on violently and is spontaneous, intermittent hearing loss, and a feeling of congestion in the ear or tinnitus. You may also experience cold sweats, palpitations, trembling, blurry vision, nystagmus, diarrhea, or anxiety and fear. When the attack subsides, you will probably need to sleep for a few hours to recover. When we talk about late-stage Meniere’s we are talking about a set of symptoms, not a time period. At this point, hearing loss is more significant and fluctuates less often. Instead of attacks of vertigo, you may have more issues with vision and balance. Tinnitus and congestion in the ear are stronger and more consistent. Drop attacks may occur. This means you may fall down suddenly but not pass out. You may even feel as if someone pushed you from behind, but in reality no one pushed you. Late-stage Meniere’s is intensified by low lighting or when you are very tired. Also, visually stimulating situations can make it much worse. If you seek care from a medical doctor for Meniere’s disease, you will likely be given some of the following suggestions. There are basically two categories of care — ways to reduce the severity of an attack while it is occurring or reducing the severity of attacks long term. Medical doctors report these areas of care usually work in about 60 to 80 percent of the cases. The most non-invasive and long-term care for Meniere’s disease in the United States is the suggestion of following a low-salt diet and adding a diuretic to your regime. Diuretics, or water pills, help reduce fluid retention in the body and may help control some of the fluid buildup in the inner ear. This can result in reducing inner ear pressure. Another suggestion that may be made is having vestibular rehabilitation therapy (VRT). This can help you deal with the imbalance you may have in between attacks. It helps by retraining your body and brain to process balance information. If successful, you may regain your self-confidence in the ability to move around. There is about 20 to 40 percent of people who do not respond to the conservative care of medication or dietary restrictions. For these people, a medical doctor may recommend something with a higher risk involved. One method is injecting the ear with an antibiotic. This is called intratympanic gentamicin. The injection destroys the vestibular tissue. Another type of injection that has a lower risk of hearing loss and persistent imbalance is that of using intratympanic steroid injections. The last resort is surgery. There are two surgeries that may help. One is done to relieve pressure on the inner ear. The second is used to block the movement of information from the affected ear to the brain. This involves destroying the inner ear so it is unable to send balance information to the brain. Or, the vestibular nerve may be destroyed so that it cannot send information to the brain. Physical therapy is necessary afterward to help the brain cope with the loss of information after surgery. Many people are opting for a more natural approach. One method proven to be effective is that of upper cervical chiropractic care. Why does it help Meniere’s? Upper cervical chiropractors focus on the underlying cause of Meniere’s disease by looking at the alignment of the C1 and C2 vertebrae, the top bones of the neck. A misalignment in one of these bones can have a negative effect on the vestibulocochlear nerve and, in turn, the inner ear. A study demonstrates the effectiveness of this type of care. A group of 139 Meniere’s patients was given adjustments by an upper cervical chiropractor. They reported that the severity of their vertigo went from an 8.5 out of 10 down to a 1.4 in a mere 6 weeks. Reducing the stress put on the brainstem by the misaligned vertebrae of the neck can make a huge difference for you and may help you find the relief you’ve been looking for. UCM Social Media Team2019-04-16T19:04:53+00:00June 10th, 2018|Vertigo / Dizziness / Menieres|Comments Off on Meniere’s Disease — Is There Any Help Available?